It is 21 degrees in Upstate New York today and I am thinking about our trip to Southern California last summer. I miss the warmth of Southern California and I am craving an In-N-Out Burger. No trip to California is complete without lunch at In-N-Out Burger. In-N-Out Burger was founded on the West Coast in 1948 in Baldwin Park, California. It was the first drive through hamburger stand in California. 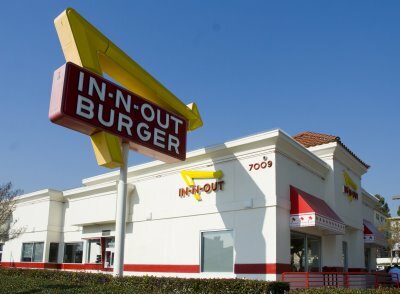 In-N-Out Burger has developed a cult following around the country. In-N-Out Burger was founded on a simple purpose that still drives it today. Last summer we visited Southern California on vacation. In-N-Out Burger was high on our list of “must do” things this summer. After a morning and early afternoon touring Point Loma, we visited an In-N-Out Burger in San Diego. As usual, the parking lot was full and there was a line out the door. Our lunch was prepared quickly and as usual was delicious. The menu at In-Out-Burger is simple; burgers, fries, shakes and soft drinks. Unlike most fast food giants, no meal is prepared until the customer orders it. In-Out-Burger also has a not so secret menu where your burger is customized to your tastes. In-N-Out is a privately owned company that has resisted expanding through franchises for fear of sacrificing quality for profits. In-N-Out places quality,customers and employees at the center of its business. This approach has helped In-N-Out become a cultural institution with a very loyal following. Have you eaten at an In-N-Out Burger? Please share your experience.